» home » magazine » 2010 » january 2010 » how much does an accident really cost you? How Much Does an Accident Really Cost You? Ron Pitcher is president, of Pitcher Insurance, Palatine, IL: 847/705-5560; e-mail: ron@pitcherinsurance.com; www.pitcherinsurance.com. 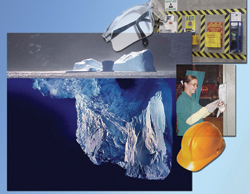 are similar to an iceberg—the visible part of the iceberg corresponds to the direct “insured costs” of an injury claim, while hidden from obvious view are the larger indirect and usually uninsured costs remain. It is these “uninsured costs” that can lead to devastating affects to a company’s bottom line. Workplace accidents have obvious, direct financial ramifications, including medical, hospital, and rehabilitation expenses, lost wages, higher insurance premiums and, in some cases, a total loss of insurability. However, there are many indirect costs that are usually uninsured and can seriously affect a company’s profitability, and can be much greater than the insured loss. These uninsured indirect workers’ compensation costs result from the marginal inefficiencies to the manufacturing or service process caused by a work-related injury. As an example, assume that one of your employees (unfortunately) suffers a serious injury on the job that requires surgery and eight weeks a from his job. It is relatively easy to measure the workers’ compensation benefits paid for this injury. In most states, your insurance carrier must pay, on your behalf, all medical bills associated with the injury and disability (wage-replacement) payments. Your workers’ compensation loss runs should give you a good idea of the total insured cost of an injury of this type. • Costs associated with the inactivity of manufacturing equipment or inventory as a direct result of the injured worker’s absence, if he is not replaced at least temporarily. This equipment or inventory would be idle and completely incapable of contributing to your production or delivery of services. • The cost incurred by temporarily replacing the injured employee, which may take the form of overtime paid to existing employees, the hiring of a temporary worker or paying a job-placement firm. • The direct cost of your operation being disrupted. While you may have temporarily replaced the injured employee, in many cases the replacement employee (either an existing employee or a temp) may not be as productive as the injured employee. The injured employee has been trained and is experienced, which might make them extremely difficult to replace in the short-term. Also, the injury itself can prove very disruptive to other employees, who usually take time to discuss the injury, which affects productivity. In addition, fellow employees may depend on the injured employee to optimize his own productivity and, because that has been lost, their productivity now is compromised. Rarely does the injured employee come back to work at 100-percent capacity. It takes time for him to become reacclimated to his job. This is further accentuated if the employee must be permanently assigned to a new job to accommodate some physical restrictions. During this readjustment period, you have a less than 100-percent productive employee. • Extra cost to meet customer commitments. If the injured employee had been working to complete a rushed order, you may incur additional costs to ensure that customer commitments are honored. Unfortunately, uninsured costs rarely are accounted for by most business owners and financial managers, because they are not easily identifiable. It’s difficult to accurately measure the financial impact and obtain reliable information to allow business owners and financial managers to appropriately deploy scarce resources and minimize costs. However, designing safety and health practices around the credible quantification of your organization’s total cost of worker injuries is an effective to reduce short- and long-term costs. OSHA has attempted to provide a financial model for companies via its free online software—Safety Pays. However, the data used for this financial-estimation tool is based on rough estimates, driven primarily as a function of insured claims, and does not account for varying expenses incurred by different company operations. • They do not apply to a company’s specific operation. Each company has its own set of work-related risks, so using general averages or ratios, particularly if they are based on insured claims, will provide an unrealistic estimate of uninsured costs. • They have little financial credibility. Business owners and financial executives demand financial information that has credibility and relevance to their specific environment. Otherwise, they will be making decisions based on poor financial information. • The information lacks flexibility. Each worker-injury claim is different—one claim may involve very little time to administer, while another might involve lengthy litigation. Or, a major piece of equipment might be significantly damaged, or a worker injury might cause significant disruption to plant production. What is needed is a to quickly capture relevant data on an individual claim basis so that the financial information is accurate and reflects the realities of the operation. • The ratios vary too widely, from 20:1 to a low of 1:1, which can cause a company to either deploy resources in the wrong direction, or to take no action at all. From our perspective, manufacturers can follow one of two paths to reduce their uninsured costs with credibility: performing an internal risk audit, or employing available software systems that accurately quantify the total economic impact of your worker injuries. Conducting an internal audit requires extensive data and research to determine each and every possible risk, a time-consuming process that can have a high rate of error, or miscalculations. Typically, indirect risks are difficult to identify, especially when the audit is done internally and could be subjective and unintentionally biased. In addition, some potential risks may be overlooked—viewed as improbable or unlikely to occur. A better solution is to apply software that quantifies the total economic impact of worker injuries, neither with guesswork nor estimates based on vague industry averages, but by using claim data and specific economic information. This third-party Internet-based product (we use CompEraser) serves as a personal risk-assessment tool that allows a company to evaluate its potential costs and risks. The program calculates all of the possible areas of risk, and evaluates where the strongest threat of liability lies. Companies can then focus on their most imminent areas of risk, reducing overall cost of losses due to work-related injuries.